In the beginning of the year 1992, the then Chief Justice and Judges of the Honorable High Court of Sindh felt the importance of judicial education and training for the judges in the province of Sindh. 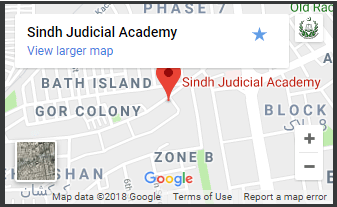 Thus, the Sindh Judicial Academy was set up in May 1992 under a resolution of the High Court of Sindh. In the year 1993, the Sindh Judicial Academy Ordinance, 1993 (Ordinance No.XVIII of 1993) was promulgated to provide legal cover for its working and functions. 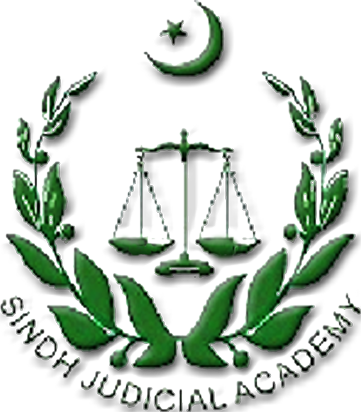 In the year 1994 Sindh Assembly repealed the Ordinance by the Sindh Judicial Academy Act, 1993 which was promulgated on 7th March, 1994 (Act IX/94). So far, SJA has trained 64 batches of judges, law officers including the officers of JAG branch of armed forces have been trained by the Academy. In the beginning, the Academy started functioning in a portion of the High Court Building under the able leadership guidance of Late Justice Z.A. Channa. The Academy functioned for sometime in a court room of the Annexe Building of the High Court with inadequate facilities but in the year, 2003 it was shifted to the High Court Bungalow Nos.1 & 2 at Bath Island, the present location. The High Court under the direct supervision of the Hon’ble Chief Justice, Mr. Justice Sabihuddin Ahmed, Mr. Justice Ata ur Rehman, Mr. Justice Musheer Alam and Mr. Justice Khilji Arif Hussain completely renovated the Academic and Administrative blocks of the Academy and provided two furnished and renovated buildings to serve as hostels for the trainee judges. The Board of Governors (B.O.G.) provided a dynamic and visionary direction to the Academy. At this crucial point, the B.O.G. requested Mr. Justice Saleem Akhter to lead the Academy, who accepted this responsibility and offered to work purely on honorary basis and started functioning as such w.e.f. 02-02-2007 till 12-04-2013. To realize the vision and direction of the B.O.G. far reaching steps were taken to transform Academy into Center of Excellence. The entire academic activities were carried out with the assistance of visiting faculty members but now a permanent faculty has been added to the Academy. In this respect, the Access to Justice Program (AJP) has assisted the Academy and Civil Law Expert, Criminal Law Expert and Curriculum Development Experts had been appointed. Now the training is imparted by the permanent faculty members and visiting experts who comprise of retired judges and leading advocates. Previously the academic and hostel for the trainee judges were situated in the same premises but now besides the two separate blocks reserved for administrative and academic activities; four hostel apartments situated at Judicial Complex are in operation. It was noticed that the output of the staff was at the minimal but due to proper organizational approach and orientation in the administrative set-up, the output of the staff has increased. Some new posts have been created and now the Academy is running as an institution heading towards its goal of transforming into a Center of Excellence.